It´s very simple to start the file manager Q-Dir with your favorite settings, to open favorite folders in Explorer View at Q-Dir Start! Starting with a favorite setting is very popular for the Q-Dir users, so that all four File Explorer lists views and other settings will be saved as a Desktop *.qdr configuration file then, for example directly start the folder combination from the Windows Desktop, no matter if it is Windows 10 Server 2016/2012 and older Windows Microsoft operating systems (PS: MS-DOS-Not)! Please always use the latest version of ... The Quad Explorer! 2.) ... For portable Q-Dir without register *.qdr! 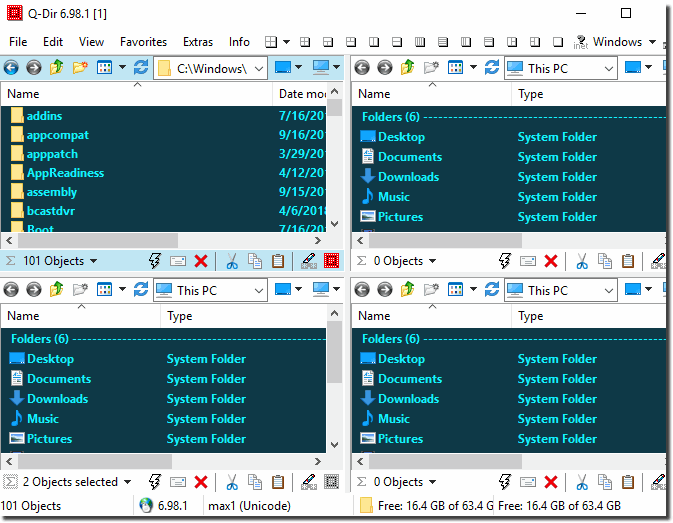 Open the Favorite-Folder combination in Q-Dir in this Example 4 x This PC on Windows 10 and then click on the menu File ►Save Current State at Desktop Item and use this item to start Q-Dir. Note: You can have several favorites settings on the desktop and use them to start Q-Dir. Please create a bat file! For example 4xC.bat and start Q-Dir via 4xC.bat! (... see Image-2 Arrow-1 and 2)! 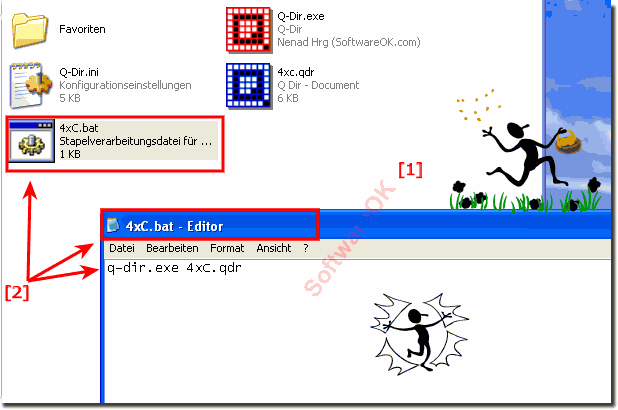 (Image-2) Start Portable Q-Dir with a favorit setting! Q-DIR - FAQ-4: How can i start with a favorite setting for explorer views? Color filter for files and folders in Explorer views eg MP3, but how? Why again opens 4 times my computer, last setting is lost in File-Explorer-Views?